The SUMMER CHALLENGE is an incentive and theme-based program that encourages children and teens to read and learn during the nine-week session. To make reading and learning fun, children enjoy performances and presentations by musicians, artists, dancers, magicians, storytellers, museum staff, and STEM educators. 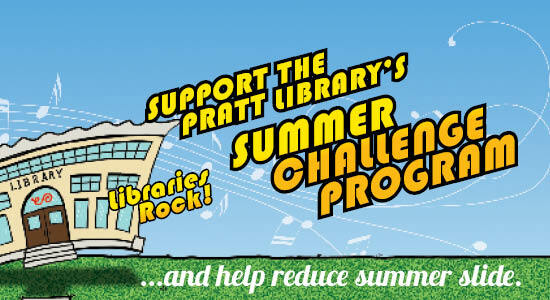 SUMMER CHALLENGE programs at the Pratt Library help reduce “summer slide,” a loss of academic skills that students may experience in July and August. This loss is nearly impossible to make up, compounds over time, and particularly impacts children in underserved communities. YOUR GIFT OF $75 will provide one child with ﻿a full summer’s worth of programs.